This was another one of those "the-girls-are-already-asleep-and-I-still-need-to-take-a-picture-and-I'm-all-tapped-out-of-ideas-at-the-moment" days. At least it's done. So.... I'm sharing a fun craft. I got the idea for this menu from my friend, Beth. I used burlap-looking scrapbook paper inside an 8x10 frame and letter stickers. 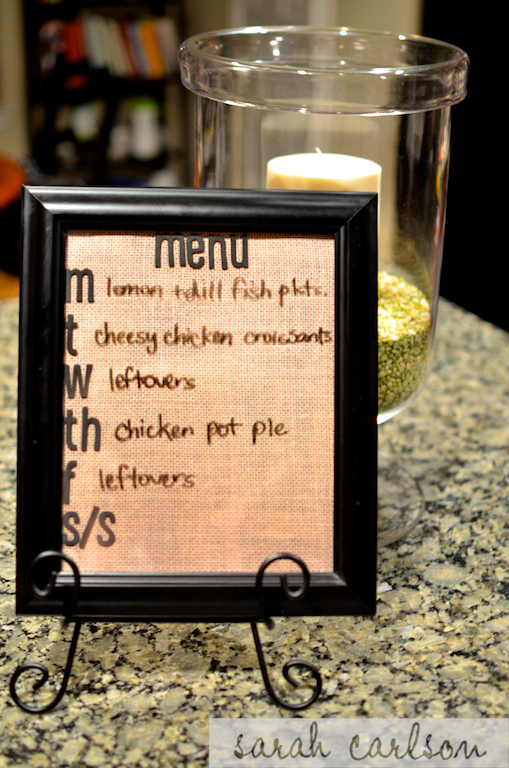 I use a dry erase marker to write down the week's meals. I'm not so crafty as I used to be, but I enjoy it when I take the time!